Festival of Sail Sandusky planned for September 3 - 5, 2016. 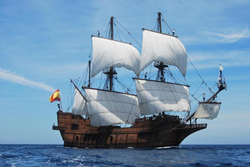 Historic ships to hail from all over the world, including replica 16th Century Spanish El Galeon. “We’re privileged to welcome back the historic ships, which last visited here in 2003,” said Craig Samborski, one of the Festival of Sail Sandusky’s event producers. The shores of Sandusky Bay will play host to the Festival of Sail Sandusky, an event showcasing three international and domestic historic sailing vessels, with a possible fourth ship in the works. It’s been more than a decade since the burgeoning Great Lakes town has seen sailing ships of this magnitude docked up on Jackson Street Pier. While Sandusky will be the only Great Lakes town to host an official Festival of Sail in 2016, the Lake Erie town finds itself included in some great company — Coos Bay, Oregon; Tacoma, Washington; Victoria, British Columbia; Richmond, British Columbia; San Francisco and Los Angeles, California are among the larger cities also hosting Festival of Sails the following year. From onboard ship tours and day sails to live music, local food vendors and performers, the Festival of Sail Sandusky will have something for everyone in the family. Ships currently planned to attend include the 16th Century Spanish replica El Galeon, local favorite U.S. Brig Niagara and General Patton’s personal schooner yacht, When and If. For more information please and tickets please visit http://www.festivalofsailsandusky.com and visit us on Facebook for updates. Sandusky Festival of Sail is presented by Draw Events and Green Door Mediaworks. Draw Events and Green Door Mediaworks have produced Battle of Lake Erie Bicentennial, Tall Ships Los Angeles, Tall Ships Philly/Camden and Tall Ships Duluth. Upcoming events include Festival of Sail Sandusky, Ohio; Coos Bay, Oregon; Tacoma, Washington; Victoria, B.C. and San Francisco, CA.